Who Is the Allegiant World MasterCard Good For? If you live in an area served by Allegiant Air, you should consider getting the Allegiant World MasterCard from Bank of America. It’s the only way you can earn points with the airline, and the card comes with some nice perks, including a free companion ticket and double points for dining out. Allegiant is a low-cost carrier known for its cheap flights on typically underserved routes from small- and medium-sized regional airports. The airline also focuses on holiday travel, offering vacation packages with hotel and/or car rental options as you book your flight online. The most potentially lucrative benefit of this card is the free companion fare with every itinerary booked through the airline that includes a hotel stay of four or more nights or a car rental of seven or more days. Allegiant’s airfare is cheap, and you’ll probably end up paying for at least one bag on top of the basic fare, but this benefit could still be worth several hundred dollars. Cardholders also get priority boarding and a free beverage on every flight. Depending on the flight and the beverage, that could be worth up to about $20 per flight. You’ll get double points for dining out, which is an unusual perk for a co-branded airline card, and triple points for Allegiant purchases. While the latter sounds generous, the carrier adds a 3.2 percent fee to all purchases made with a credit card, including their own co-branded card. If you use a debit card, on the other hand, there is no fee. Though the card has some nice benefits, it does come with a $59 annual fee that is not waived for the first year and a meager 15,000-point sign-up bonus. You’ll get 15,000 points after making $1,000 in purchases within the first three months. The value of Allegiant points are fixed at one cent each. So the 15,000-point sign-up bonus is worth $150 and can be used as a statement credit toward any Allegiant Air purchase, including airfare and vacation packages. 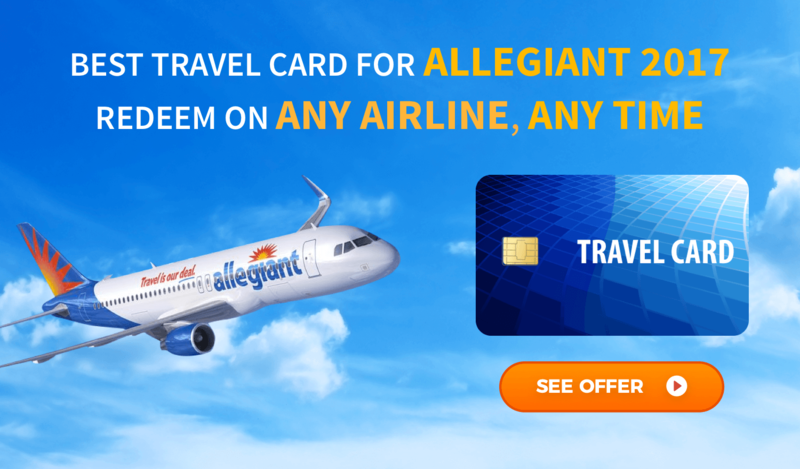 You cannot earn Allegiant points without this card, nor can you earn points or status by flying. That’s because the carrier does not have a frequent flyer program. Make no mistake, this is essentially a cash back card that allows you to redeem for Allegiant purchases only. If you don’t think you’ll take advantage of the companion fare, you might want to consider a more flexible cash back card with a bigger sign-up bonus. Allegiant Air tickets are cheap, so you’re points will go relatively far. You can get away from the New York City winter by flying roundtrip between Newark and Savannah/Hilton Head for as little as $118, or 11,800 points. Of course you’ll have to add baggage fees to those flights, even if you travel light and bring only a carryon. The cost per bag varies from $10 to $75, depending on the route and when you pay for it. For example, if you pay when you book, a carryon costs $15 and a checked bag is $20 for the flight from Newark to Savannah. If you add a bag after you book and before you get to the airport, it’ll cost $45. At the airport, you’ll be stuck with a $50 fee. Those prices are typical for many of Allegiant’s routes, but some cost even more.